Some people, mainly my Mam, sometimes suggest that I might be a little obsessed with football. I’m not sure that’s the case though. I think if I am over-keen on anything, it’s live sport. I don’t really watch much sport on the telly these days but if there’s something happening nearby then I invariably make the effort to be there. On this occasion Jen and I were having a few days over in the Lake District. It’s one of my favourite places in the UK and somewhere I’ve been going to since I was a kid. We’d been hiking on each of the previous four days, including slogging up Great Gable from Wasdale Head and so when I spotted in one of the local papers that there was a hound trail taking place I thought we could have a day off from the walking whilst I got my live sport fix. 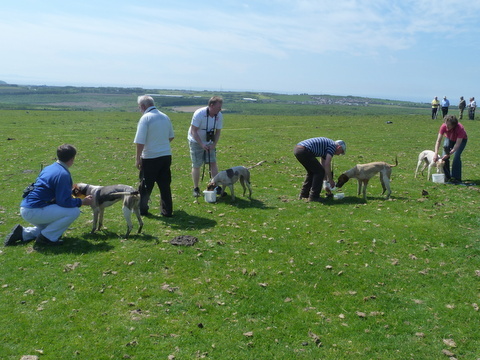 I’d never been to a hound trailing event before, but imagined it to be just a countryside version of greyhound racing, similar to the relationship between Point-to-Point and proper horse racing. The directions on how to get there weren’t the easiest to follow but Steel Brow is a fell just outside of Frizington. As we got close, we found and followed some temporary signs, pausing at the entrance of a field to hand over a tenner. There were already a couple of dozen cars inside, with a few people sat around in camping chairs. Most appeared to have dogs with them, mainly fox hounds that I presumed were competing, but plenty of other breeds as well. I had a sneaky wish that there would be events for the likes of Pugs and Pekingese. I’d have paid double for those races. With the first event of the day about to start I popped over to the bookies to place our bet. There’s not much form to go on, at least nothing that outsiders get to know about and so we had to use a combination of tips from the article in the paper, the odds themselves and gut feeling over the name of the dog. You couldn’t make your selection based upon what the dogs looked like as there was no way of identifying them. If one had been hopping along on three legs I wouldn’t have known which dog to avoid backing. I dare say their owners knew which was which but for the likes of us first time punters they were just hounds on leads heading off to a corner of the field from where the race would start. That was pretty much the last we saw of them for around twenty minutes. 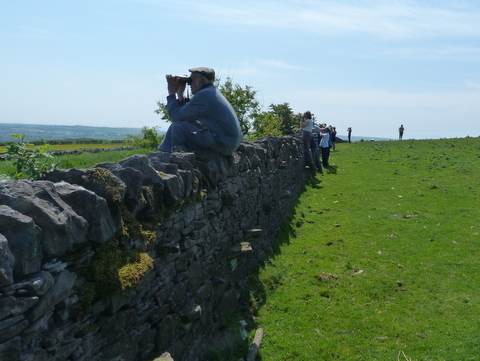 After a while everyone wandered across the grass to look over a wall towards the fields in the distance. We didn’t have binoculars, but I’m not sure it would have made any difference if we had. 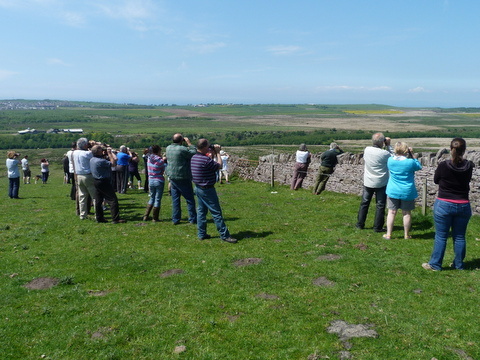 A few minutes later the crowd headed over towards a different wall and again stared out into the middle of nowhere. I still couldn’t see any dogs. The hounds could have still been sat in the corner of that first field for all we knew, possibly biding their time with a crafty fag before deigning to reappear looking suitably breathless. 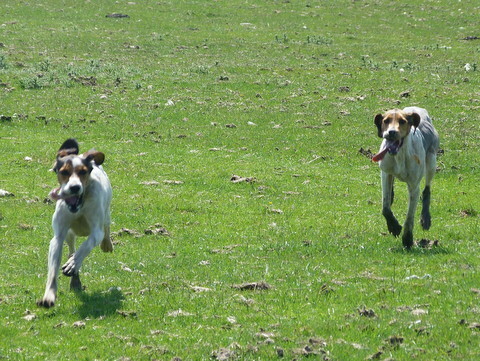 Eventually the dogs came into sight and bounded back up the field towards their owners. It was pointless cheering any of them home as we had no idea which one was the one we’d backed. 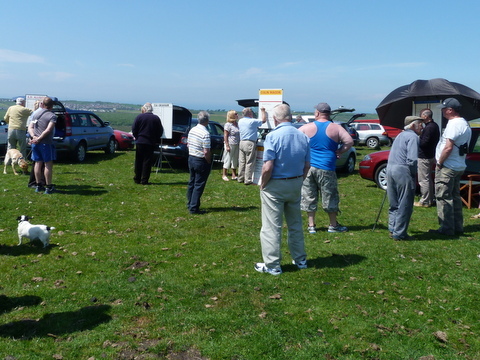 It struck me as similar to pigeon racing as a spectator sport, although mercifully quicker. Once over the line the dogs were rewarded with a drink, some food and a rosette if they were amongst the first half – dozen back. 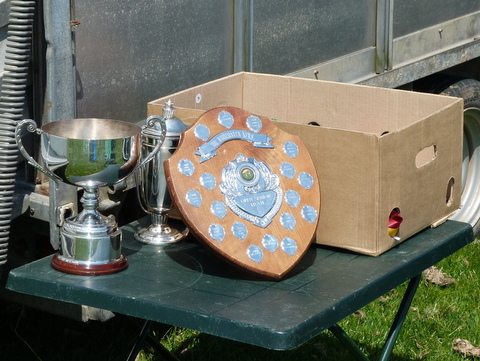 The winners of the big races went home with trophies, an increased breeding value and an intention to sleep for the rest of the day, I’d imagine. We had to ask around for the result to find out if we needed to go back to the bookies for our winnings. I can’t really see why the dogs don’t wear numbered jackets like at the greyhound racing. Ideally luminous coats so we could spot them in the far-off fells. 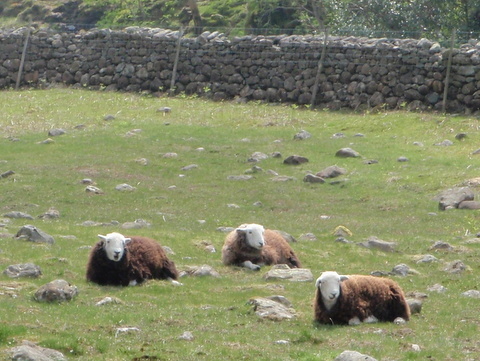 Failing that, if they want to keep it ‘country’, maybe daub some of that paint on them that they mark the sheep with. At least you’d be able to see where your selection finished. Here’s what you could have won. I think we saw three races in total and that was enough for us. It was an interesting experience, but we’ve done it now and I doubt we’ll be back. After all, I can have a day out in the countryside staring aimlessly into the distance anytime I like.